Lipids 2 Phospholipids and Steroids. 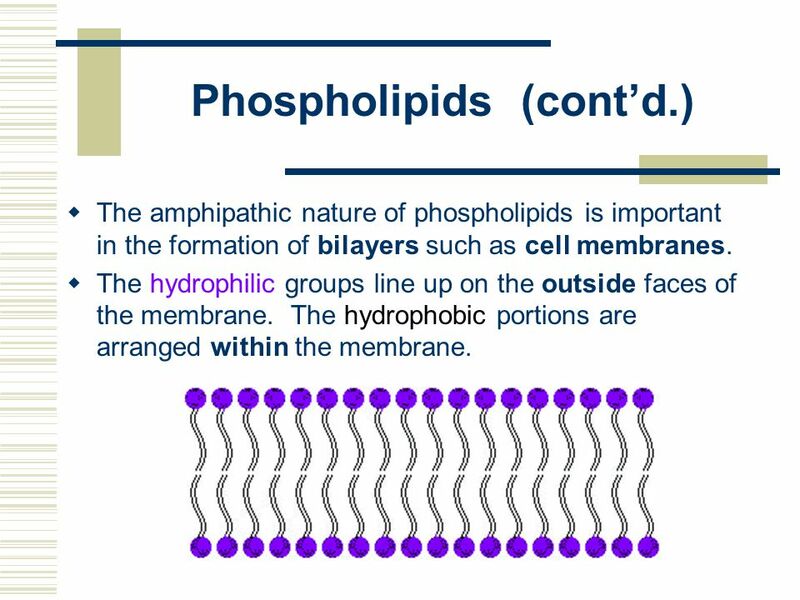 Phospholipids  The structure of phospholipids is based on the structure of triglycerides but the third hydroxyl. 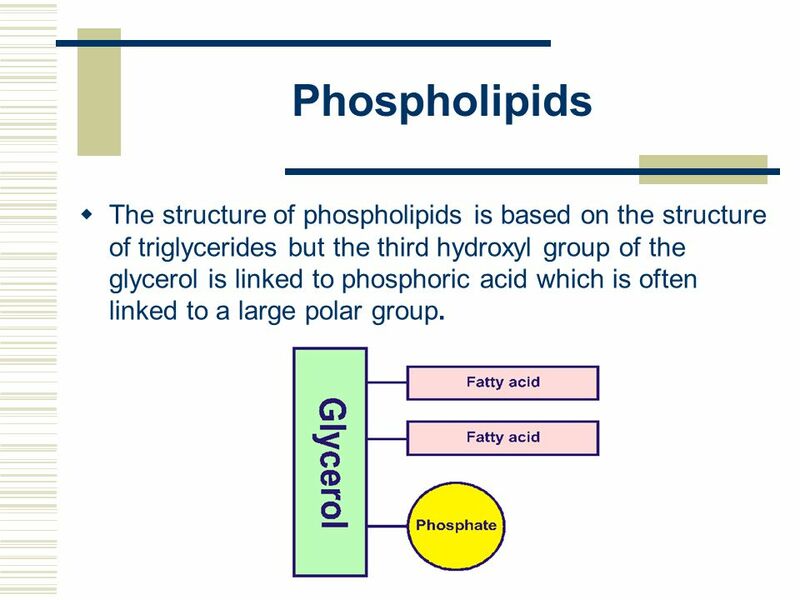 2 Phospholipids  The structure of phospholipids is based on the structure of triglycerides but the third hydroxyl group of the glycerol is linked to phosphoric acid which is often linked to a large polar group. 3 Phospholipids (cont’d.)  The fatty acids which make up phospholipids have a consistent length of between 16 and 18 carbons. This allows them to form neat bilayers.  Phospholipids are said to be amphipathic, having two very different sides to their nature. 5 Phospholipids (cont’d.)  The amphipathic nature of phospholipids is important in the formation of bilayers such as cell membranes.  The hydrophilic groups line up on the outside faces of the membrane. The hydrophobic portions are arranged within the membrane. 6 Phospholipids (cont’d.) 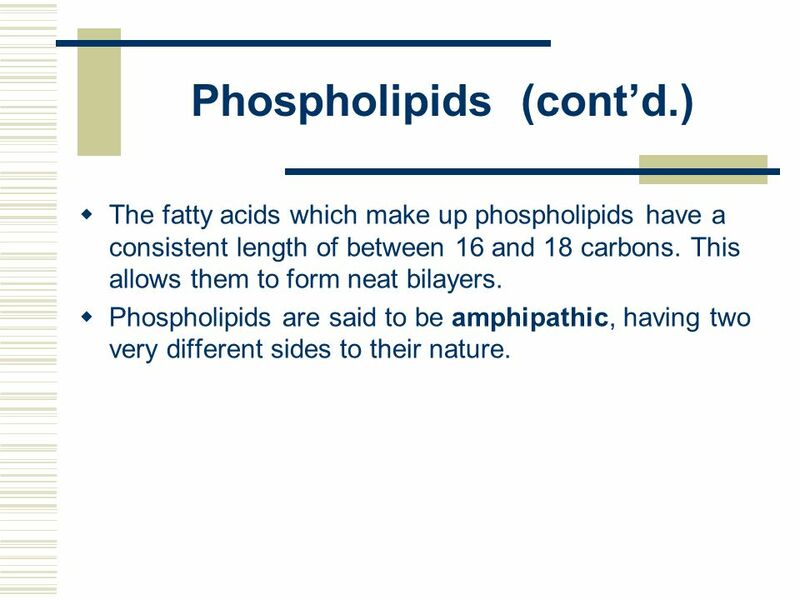  Phospholipids may have fatty acids which are saturated or unsaturated. 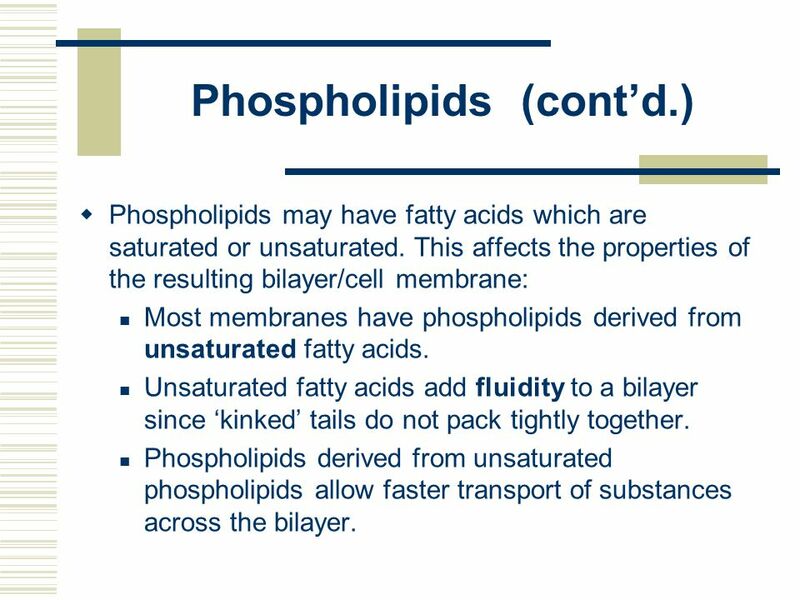 This affects the properties of the resulting bilayer/cell membrane: Most membranes have phospholipids derived from unsaturated fatty acids. Unsaturated fatty acids add fluidity to a bilayer since ‘kinked’ tails do not pack tightly together. Phospholipids derived from unsaturated phospholipids allow faster transport of substances across the bilayer. 7 Phospholipids (cont’d.)  Membranes exposed to the cold have a very high percentage of unsaturates e.g. 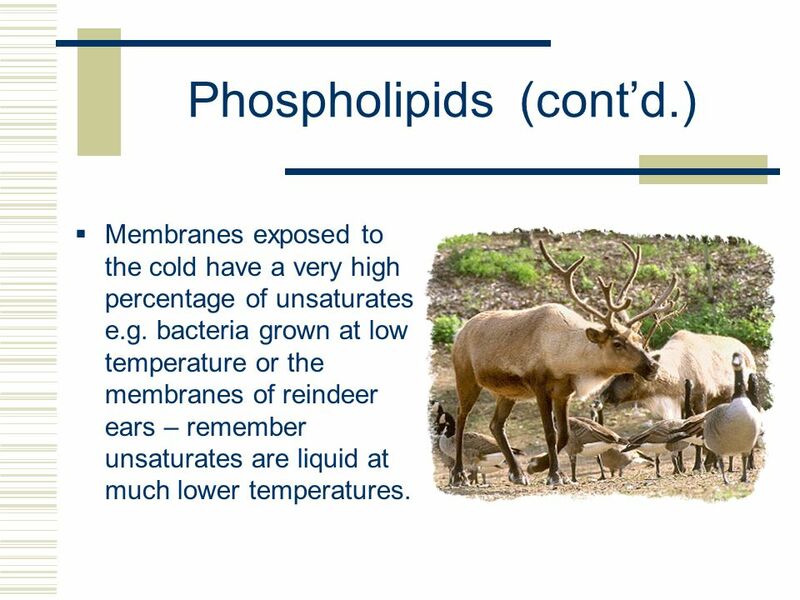 bacteria grown at low temperature or the membranes of reindeer ears – remember unsaturates are liquid at much lower temperatures. 8 Phospholipids (cont’d.) 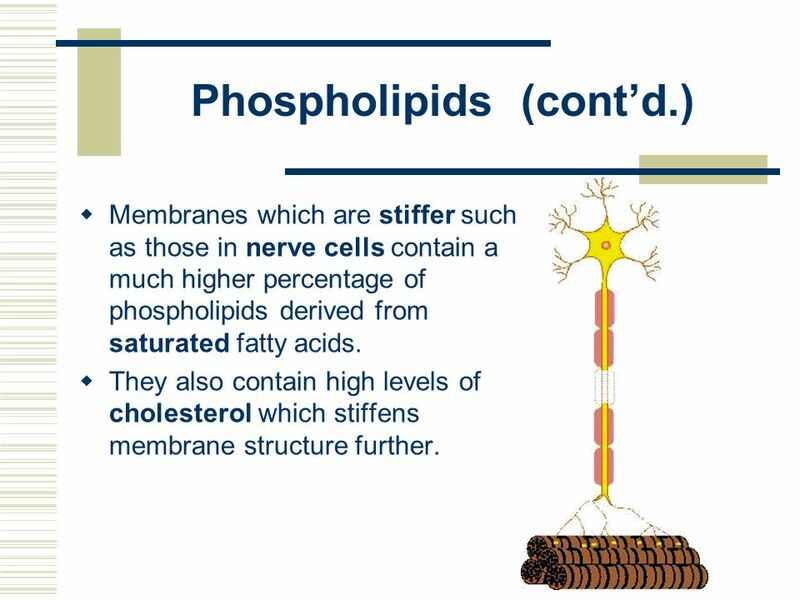  Membranes which are stiffer such as those in nerve cells contain a much higher percentage of phospholipids derived from saturated fatty acids.  They also contain high levels of cholesterol which stiffens membrane structure further. 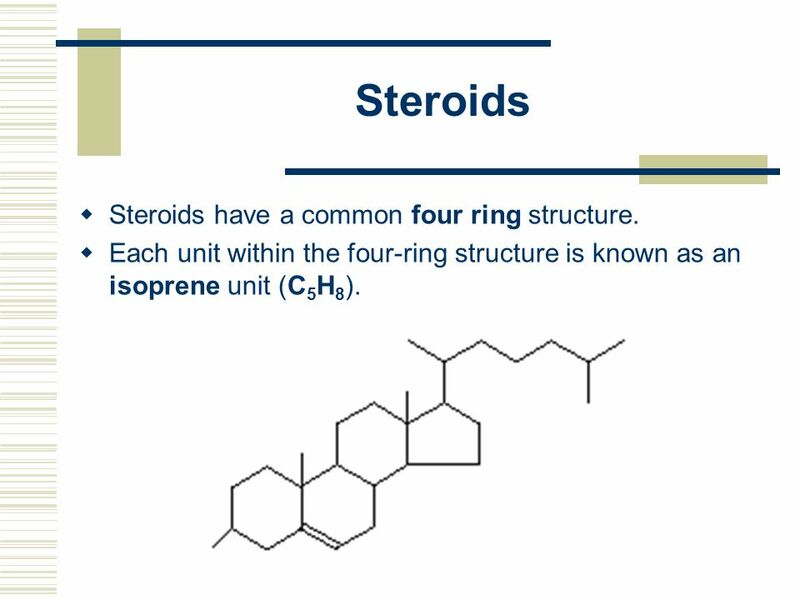 9 Steroids  Steroids have a common four ring structure.  Each unit within the four-ring structure is known as an isoprene unit (C 5 H 8 ). 10 Steroids (cont’d.) 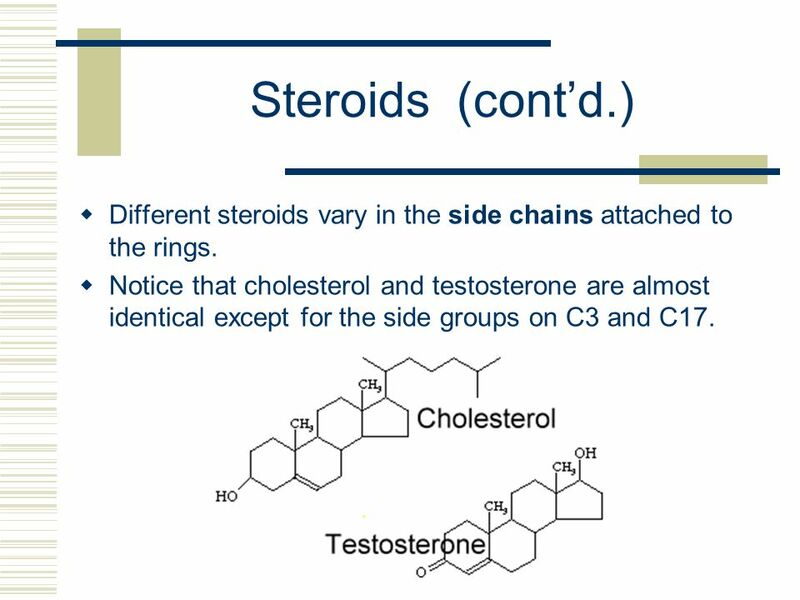  Different steroids vary in the side chains attached to the rings.  Notice that cholesterol and testosterone are almost identical except for the side groups on C3 and C17. 11 Steroids (cont’d.)  Steroids are classified as lipids since they are soluble in organic compounds but not in water. They have a very powerful effect because of this as they can pass through cell membranes.  Steroids are hormonal in function and have a wide variety of functions. 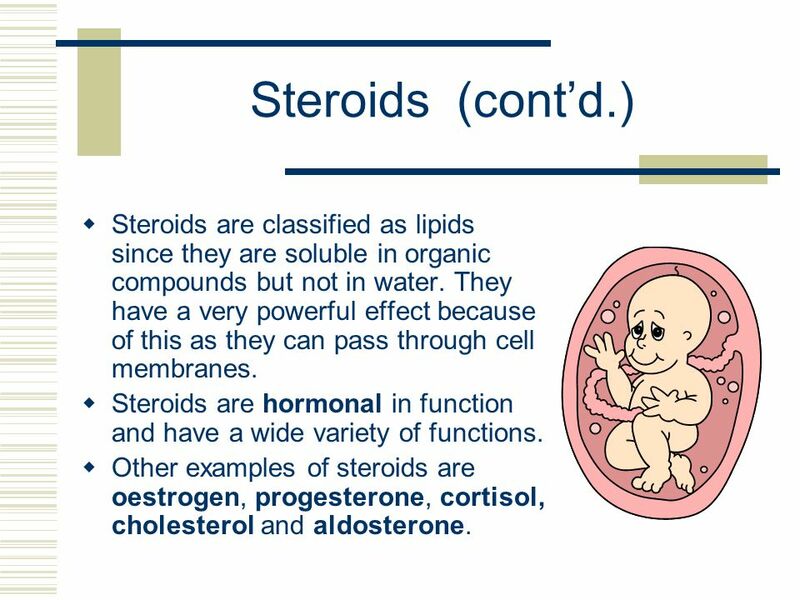  Other examples of steroids are oestrogen, progesterone, cortisol, cholesterol and aldosterone. 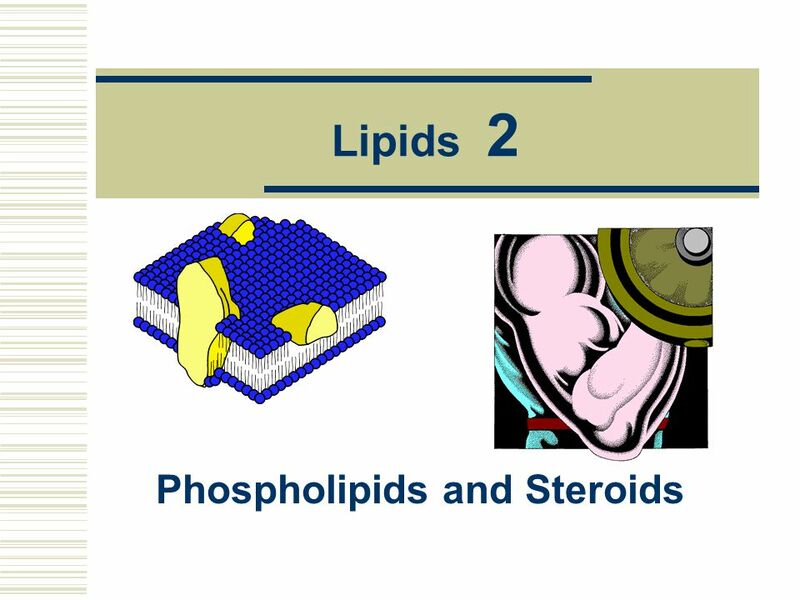 Download ppt "Lipids 2 Phospholipids and Steroids. Phospholipids  The structure of phospholipids is based on the structure of triglycerides but the third hydroxyl." Plasma Membrane Notes. CHARACTERISTICS: Maintains homeostasis (balance with environment) Selective permeability – allows some molecules into the cell. © 2011 Pearson Education, Inc. Key Concepts Plasma membranes are made up of selectively permeable bilayers of phospholipids. 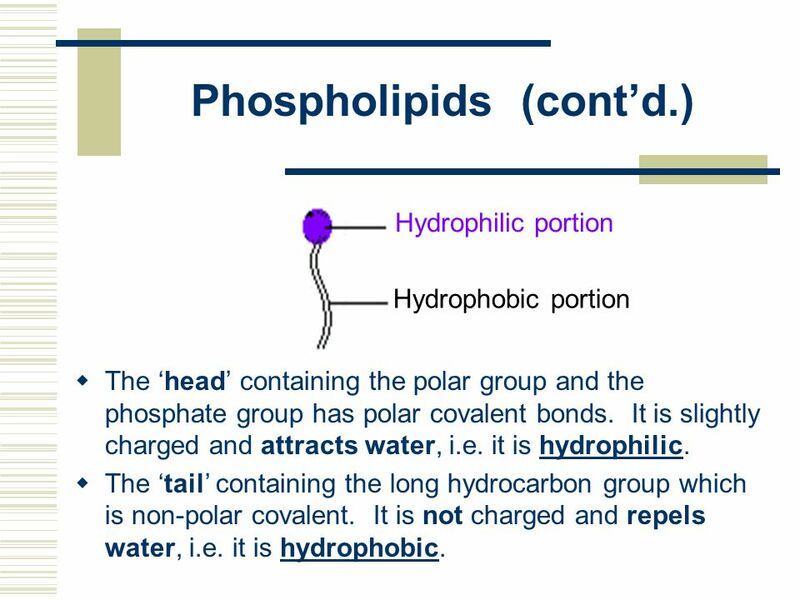 Phospholipids are amphipathic. Biochemistry Part V Lipids. Lipids A class of organic molecules that are insoluble in water A class of organic molecules that are insoluble in water There. Chapter 5 Macromolecules-Lipids Lipids Lipids are composed of C, H, O – long hydrocarbon chains (H-C) “Family groups” – fats – phospholipids – steroids. © SSER Ltd.. Lipids are a diverse collection of substances that have a range of different functions in living systems Lipids are compounds that serve. Lipids - Diverse Hydrophobic Molecules 1. Fats store large amounts of energy 2.Phospholipids are major components of cell membranes 3.Steroids include. CHAPTER 2 THE STRUCTURE AND FUNCTION OF MACROMOLECULES Lipids - Diverse Hydrophobic Molecules 1.Fats store large amounts of energy 2.Phospholipids are. Introduction Lipids are an exception among macromolecules because they do not have polymers. The unifying feature of lipids is that they all have little. Fats (an example of a lipid) Glycerol – Has three –OH groups – Polar molecule Soluble in water Fatty Acids – Long chains of hydrocarbons Insoluble in water.